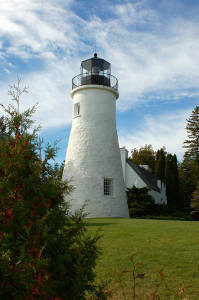 The Old Presque Isle Lighthouse is one of the oldest surviving lighthouses on the Great Lakes. Built in 1840 by Jeremiah Moors of Detroit, the harbor light operated until 1871 when the keeper transferred to a new, taller, coastal lighthouse a mile to the north. Visitors can climb the hand-hewn stone steps of the thirty feet tall tower for a panoramic view of the Lake Huron shoreline and Presque Isle Harbor. The keeper’s dwelling serves as a hands-on museum. Here, visitors can blow foghorns and examine other interesting artifacts. They can also ring the bell from the Lansing City Hall clock tower and pose for the perfect photo opportunity with head and hands in an old set of stocks. The buildings and park grounds are open to the public daily, from 9am until 6pm, mid-May through mid-October. A nominal fee is charged for tower climbs.